Vesta is one of the brightest objects and it is also one of the largest asteroids in the Solar System with a mean diameter of 525 km. 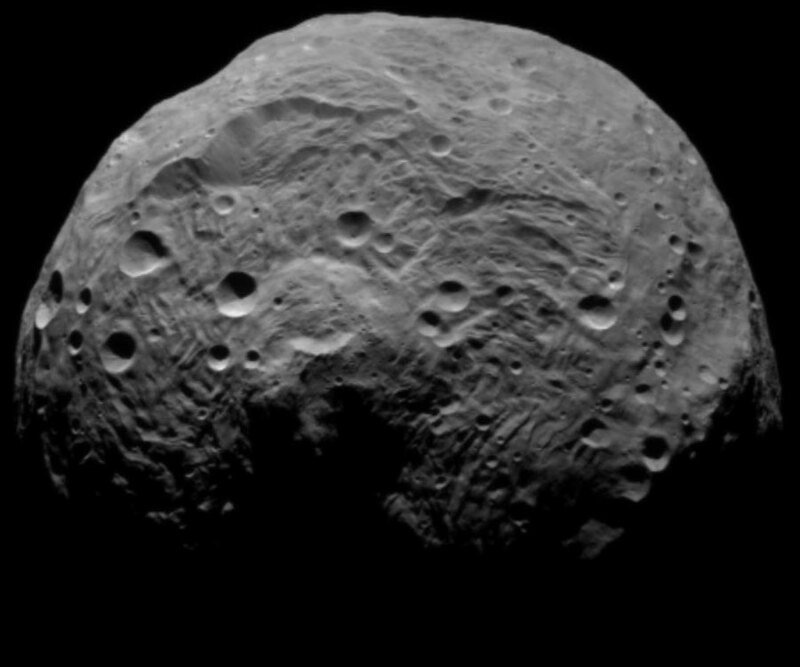 Impact-related processes have played a dominating role in (re-)shaping Vesta’s surface. 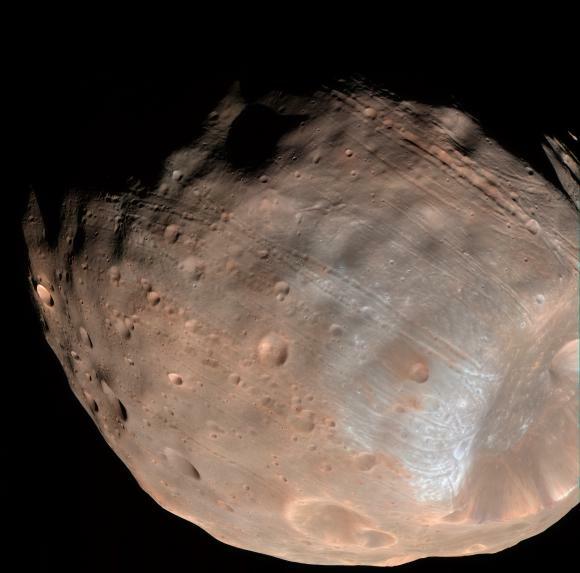 Image A shows a colored perspective view of Vesta’s surface, taken by the Dawn framing camera. From top to bottom, the three most prominent craters were named Marcia, Calpurnia and Minucia and are 58 km, 50 km and 21.5 km in diameter, respectively. They are approximately oriented along a southwest-northeast direction. The three craters, initially nicknamed ‘the snowman crater’, represent a time sequence of impact events, with Minucia having firmed first and Marcia having formed last, and most likely with some time on the orders of thousands or even tens of thousands of years in between the impacts. However, all three craters are comparably young compared to the old, densely cratered surface of Vesta, as inferred from the low frequency of small craters superimposed on their floors and ejecta blankets. The ejecta materials of Marcia and Calpurnia cover entirely, or in some parts subdue, the older cratered plains. The ejecta superposes the northern terrains and covers underlying older terrains. Outside these ejecta Vesta’s heavily cratered northern terrain is apparent, especially in the right part of the image where crater rims are enhanced by shadows. Vesta’s surface is characterized by abundant impact craters, some with preserved ejecta blankets, large troughs extending around the equatorial region, enigmatic dark material, and widespread mass wasting, but as yet an absence of volcanic features (Jaumann et al., 2012). Abundant steep slopes indicate that impact-generated surface regolith is underlain by bedrock. 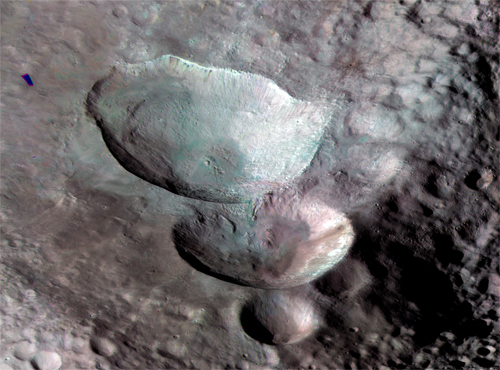 Topography plays an important role in crater formation and modification processes on Vesta. There are numerous cases of craters formed on slopes, where pronounced collapse, slumping, and ejecta deposition occurred on the upslope side as well as the downslope side of the craters. Intense post-impact processes of mass wasting within the three craters can be seen (Image B). Material has moved downslope, especially in the youngest and largest crater, Marcia, and has created terraces or has slumped on the floor of Calpurnia. A considerable number of slopes on Vesta are most probably above the angle of repose and indicative of intact bedrock beneath. Impacts onto such steep surfaces, followed by slope failure, are important geologic processes on Vesta that substantially alter the morphology of geologic features and add to the complexity of Vesta’s surface evolution. The crater floor of Marcia Crater also shows some collapse features (Image B, 2). 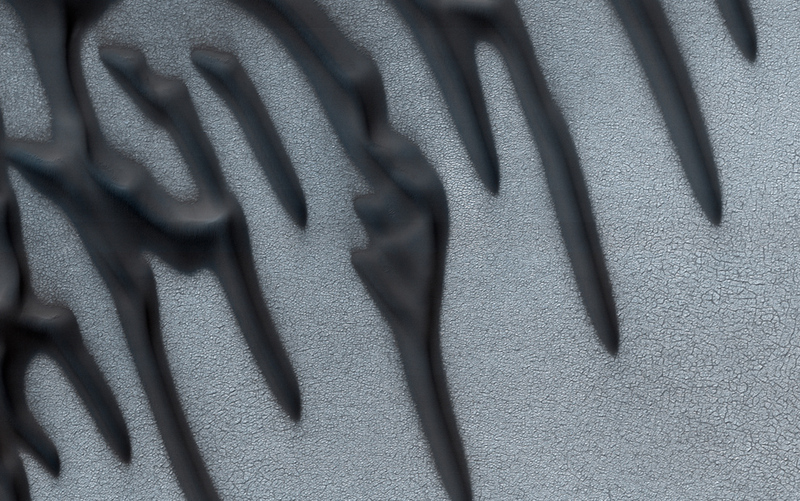 Rimless pits increase in size towards the center, coalesce and overlap each other. Pits range in size from ~30 m (near the limit of resolution at 17 m/pixel) to just over 1 km in diameter. On the floor, material that slumped down the crater walls appears to bury the pitted terrain in several areas; in others, pits may occur within the slump deposits. Individual pits are typically <50 m deep. Similar terrain is associated with numerous martian craters, where pits are thought to form through degassing of volatile-bearing material heated by the impact. Pitted terrain on Vesta may have formed in a similar manner, suggesting that portions of the surface contain a relatively large volatile component. Exogenic materials, such as water-rich carbonaceous chondrites, may be the source of volatiles, suggesting that impactor materials are preserved locally in relatively high abundance on Vesta and that impactor composition has played an important role in shaping the asteroid’s geology (Denevi et al., 2012). Image B. 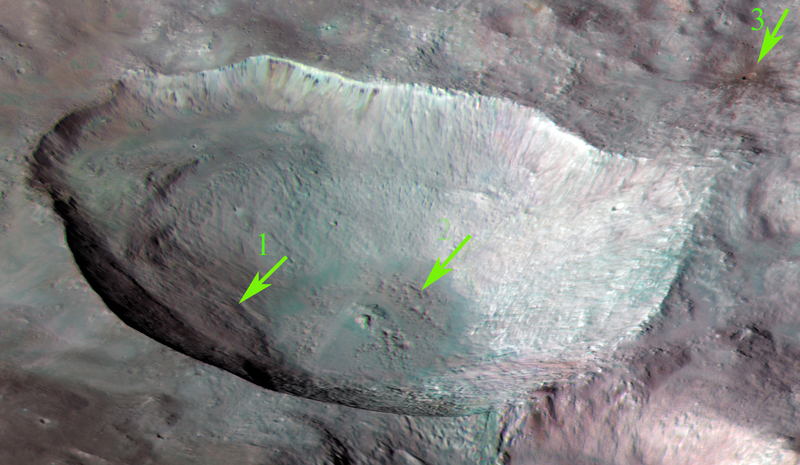 Close up of Marcia Crater on Vesta’s surface. 1. Hypothesized slumping from crater rim. 2. Rimless pits on the crater floor. 3. Young crater and dark-toned ejecta. The color filters of the Dawn camera also reveal stratigraphic relationships. While older landforms are in dark or light brown color, Marcia, including its ejecta is mostly bright and shows light green or light cyan colors, indicating that it is stratigraphically young. The only exception is a small, dark-rayed crater at the top right of Marcia (Image B, 3) which is even younger than Marcia and has emplaced dark material from a comparably shallow crustal level on the ejecta of Marcia. Similar dark material can also be seen in the rim of Marcia and Calpurnia. Jutzi, M., and E. Asphaug (2011), Mega-ejecta on asteroid Vesta, Geophys. Res. Lett., 38, L01102, doi:10.1029/2010GL045517.